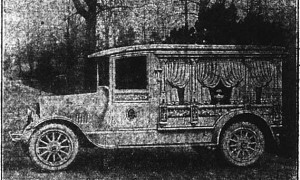 First Auto Hearse in Owensboro. James H. Davis Funeral Home, located at 3009 Frederica Street, can now say it is a centenarian. James H. Davis Sr. opened his first mortuary residence in 1913 at 120 Frederica Street. In connection with the undertaking establishment a livery barn was installed. Mr. Davis was born July 15, 1884 in Utica, KY. 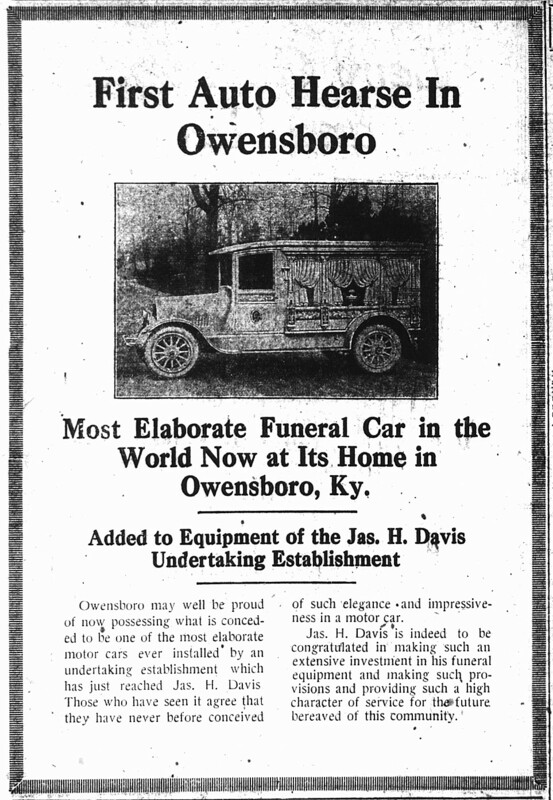 According the Messenger-Inquirer, for about seven years prior to opening the James H. Davis Undertaker establishment, Mr. Davis worked for the Owensboro Undertaking and Livery, starting as a small boy. James H. Davis Funeral Home has had several locations. It moved from 120 Frederica Street to 1002 Frederica Street. In 1926 he moved across the street to 1001 Frederica Street where he continued in business until May 25 1963, when he celebrated his 50th anniversary and built the modern funeral home at its current location. According to the Messenger-Inquirer during his 50 years in the business, Mr. Davis estimated that he had conducted nearly 10,000 funerals. He was a member of the state board of funeral directors and embalmers for 15 years. He was very active in the community and belonged to many organizations including the Masonic Lodge, Odd Fellows and was a Kentucky Colonel. Mr. Davis attended the Cincinnati College of Embalming and the Philadelphia Embalming School. He was married to the former Virginia Dawson on Jan. 1, 1921. James H. Davis died March 19, 1968 in Owensboro and is buried at Elmwood Cemetery. Direct quote from the Messenger-Inquirer, May 24, 1963. Owensboro Messenger, articles or mentions on the dates of April 13, 1919, April 20, 1919, May 24, 1963 and March 20, 1968.